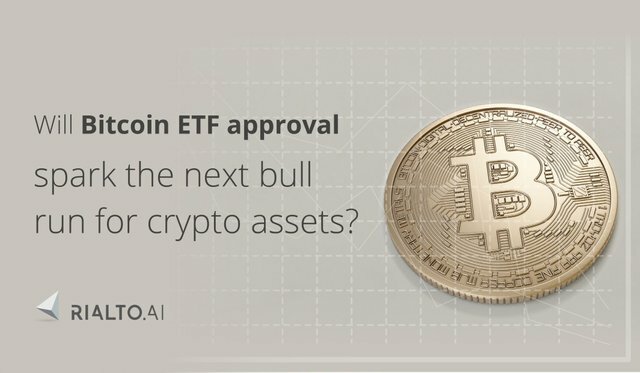 Will Bitcoin ETF approval spark the next bull run for crypto assets? With Bitcoin's price teetering on the edge of a major support line established back in early February of this year, it seems that only an ETF approval can save it from crashing through to new year-to-date lows. In this article we're going to take a closer look at what a Bitcoin ETF is and how likely it is to be a major bullish catalyst for the crypto markets. An exchange traded fund (ETF) is a collection of commodities, stocks, bonds or other assets in a single fund, whose shares are traded on the stock market. The advantage of an ETF over individual stocks or bonds is reduced risk due to better diversification, lower costs due to fewer commissions and better accessibility. Even though ETFs are similar to mutual funds, they have a number of advantages over them, such as real time pricing and trading on exchanges, lower fees, lower investment minimums and better tax efficiency. Very often ETFs will track the performance of major indices such as the S&P 500 (SPDR), Nasdaq 100 (QQQ) or Dow Jones Industrial Average (DIA). Another big group of ETFs track individual industries like oil companies (OIH), energy companies (XLE), financial companies (XLF) etc. Commodity ETFs track commodity prices including gold (GLD), silver (SLV), crude oil (USO) and natural gas (UNG) for example. Other ETFs track developed stock markets, many emerging markets, as well as currency movements. A bitcoin ETF tracks the price of Bitcoin via different indices or instruments. There have been a number of different proposals made to the SEC this year for Bitcoin ETFs from ProShares, GraniteShares, Direxion, Winklevoss and VanEck. Most of them proposed to track the price of Bitcoin based on different indices or futures without actual ownership of Bitcoin. So far, all have been either rejected, withdrawn or postponed. From the remaining proposals, the one that is showing the most promise of being approved is the CBOE BZX Exchange proposal to the SEC to list SolidX Bitcoin Shares issued by the VanEck SolidX Bitcoin Trust. Besides the reputation of CBOE and the VanEck company, the key difference from other ETF proposals is that it is targeted exclusively at institutional investors (with 25 Bitcoins per share) and backed by real Bitcoins purchased via OTC desks as opposed to on unregulated exchanges. The SEC rejected previous ETF proposals due to concerns around leverage, low liquidity of futures contracts and pricing on dubious crypto exchanges outside of their remit, all of which the CBOE's VanEck ETF proposal addresses. There have been a lot of announcements and rumors floating around the web recently regarding mainstream financial corporations preparing to enter the crypto markets including many Wall Street giants like Morgan Stanley, Citigroup and Goldman Sachs. It seems therefore that it's only a question of when, not if, we see a Bitcoin ETF traded on one of the major exchanges. The popular belief is that once that happens, the price of Bitcoin will skyrocket as institutional investors pile in. On the other hand, another rejection could send the prices tumbling down below this year's well established support line around $6,000. The date set for the SEC's decision on the CBOE's VanEck ETF proposal is only two weeks away at this stage and the stakes are getting higher with each passing day, as we count down to the 30th of September 2018. To add to the complexity, there is also a possibility that the SEC will delay their decision once again, this time to 27th February 2019. With Ethereum's recent price slump, Bitcoin is now the only major cryptocurrency, which hasn't yet fully retraced to its pre-2017 bull run levels. The possibility of a Bitcoin ETF approval is a major, but not the only factor supporting the current price of Bitcoin. Another is the mining cost, which despite the bear market has been steadily increasing and is now estimated to be over $7,000 per Bitcoin on average. Likewise, a rejection of an ETF is not the only threat. As the Mt.Gox exchange bankruptcy proceedings draw to a close, there is the threat of its 160,000 Bitcoins being suddenly unleashed onto the market. Taking all these factors into consideration, it should make for a very interesting finale to an already tumultuous 2018 for crypto assets. What would and ETF approval bring? As we saw with the rally to $20,000 per bitcoin after the announcement of Bitcoin futures late last year, the crypto markets are very quick to respond to news, announcements and rumors, without perhaps fully digesting what they actually mean. Even though the futures ended up precipitating the onset of the bear market, something like an ETF approval would undoubtedly send prices soaring once again in the run up to the actual ETF listing. The big question is what would happen then. Due to the Bitcoin's proposition as a store of value, many comparisons have been drawn with the effect of the first gold ETF listed back in November 2004, which resulted in a 318% increase in the price of gold in approximately seven years. That may not sound like much for cryptocurrencies, but after the bear market of 2018, it's nothing to scoff at. Again using gold for comparison, some market analysts have calculated that about $6.7 billion of fresh capital would pour into the Bitcoin ETF markets, which would increase Bitcoin's price by about 76%. There is little doubt that Bitcoin and cryptocurrencies are in dire need of some good news. With accusations of market manipulation and an inevitable wave of regulation heading its way, a Bitcoin ETF would deliver some much needed optimism into the crypto ecosystem. Major concerns remain though and an ETF approval at the end of September is not particularly likely. Postponement to next February would be the next best thing, as it would prevent a price crash, but it's hard to say how much more uncertainty the crypto markets can bare before we see a full scale capitulation. On the other hand, looking at the well established market cycles, a final capitulation might be just what the doctor ordered. Once that phase is over, the ground would finally be set for the next bull run. If you enjoyed this article be sure to give us an upvote and share this article on your favorite social media channels. To stay up to date with our project, consider subscribing to our newsletter and follow us on our social media channels linked below. Hi! I'm a bot, and this answer was posted automatically. Check this post out for more information.